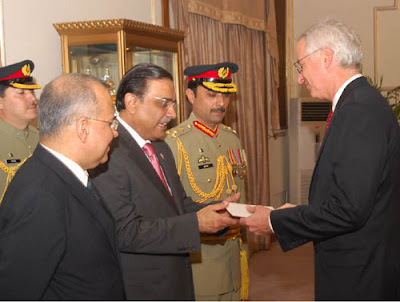 Cameron Munter, the newly appointed Ambassador of the United States to Pakistan, presented his credentials to Asif Ali Zardari at the Aiwan-e-Sadr in Islamabad today, October 27. Speaking at the ceremony, Ambassador Munter told the President, "I am looking forward to working with the democratically elected Government and with people around the country to strengthen our deep, long-term relationship based on honesty and mutual respect." The Ambassador expressed U.S. appreciation for Pakistan's sacrifices in its ongoing fight against extremism and terrorism. He also assured the President of America's continued support for Pakistan's economic development, and for regional stability. Ambassador Munter was joined at the ceremony by his wife, Ms. Marilyn Wyatt, and accompanied by Deputy Chief of Mission Stephen Engelken, Civilian Assistance Coordinator Ambassador Robin Raphel, Defense Attaché Colonel Joseph Abbott, and his personal staff. He also spoke with VOA here about rebuilding trust. On a related note, Ambassador Munter's immediate predecessor, Ambassador Anne Patterson was presented by HRC with the “Secretary’s Distinguished Service Award," at the Department of State on October 25. The event was closed to the press and no photo of the ceremony has surfaced as of yet.